The morning of day four was miserably cold, and as much as I wanted to pack up as quickly as possible, I could not get my fingers, limbs, or brain to cooperate beyond a zombie-like shuffle. The night before had been long, freezing, and uncomfortable. It still had not rained beyond a brief sprinkle here and there, but the wind remained relentless. My +15 down mummy bag, which is usually much warmer than necessary, had proven barely adequate. At some point during the night, I had to put on the fleece jacket that I had folded up under my pillow for extra cushion. I wore a wool hat, and my sleeping bag's hood was cinched tightly around my face, but the exposed area around my eyes and nose did not receive much relief from the cold air. We ate Pro Bars for breakfast because it was too windy and cold to consider lingering to make coffee and oatmeal. Plus, since we hadn't come across a water source at the end of the previous day, we did not want to waste our drinking water cooking a hot breakfast. View from the rocky bald at the top of Section 13 Cliffs at 7:30 a.m. Although we looked forward to warming up once we got going, it was cold enough that we had to start out wearing fleeces, hats, gloves, and long underwear under our clothes. We stopped for a few minutes to take photos and admire the view at the amazing 360º vantage point just down the trail. The moon stood out in the clear blue morning sky, and we were fairly sure we could see ice on the surface of a distant beaver pond. The sun shone brightly and the wind was insane. I climbed up to the highest point, where I tried to take in the moment and commit the view around me to memory before the punishing wind became too much to handle. We headed back into the woods along the same stretch of trail I had walked the day before in search of the stream that was said to be located ½ mile south of the campsite. After about 30 minutes, we came to a tiny stream, barely more than a trickle, which we estimated to be about 1 mile from Section 13. We assumed this was Sawmill Creek, the stream mentioned in the book, though we expected a little more fanfare. We stopped to filter a small supply of water here, not knowing how many of the streams we would cross that day would actually contain water due to the dry conditions. About 10 minutes after leaving this tiny stream, we reached the real Sawmill Creek, a much larger stream marked with a sign. Obviously, this stream is much further than ½ mile from Section 13 campsite – word to the wise. The hiking was noticeably more strenuous today, with a lot of steep, rocky climbs. After a few hours, we stopped at the top of a steep ascent to ditch the long underwear. We finally saw our first view of Lake Superior at 10:30 am, which was cause for celebration. Stopping to take a few photos, I had a horrible realization: It hadn't occurred to me to protect my camera batteries from the cold of the night before, and my current battery was prematurely reading as nearly drained. I put it in an inside pocket for body heat and hoped that it would revive itself. I tried to take photos sparingly during the day's hike, but of course, the scenery was really starting to get good at this point, and for the rest of the day we were met with constant scenic views of the lake to our east and the valley to our west. Luckily, the batteries had life in them again once they spent the day warming up, and I made sure to keep them and my headlamp batteries in my sleeping bag with me overnight for the rest of the trip. We descended steeply, crossed County Road 6, then climbed back up again to the top of the ridgeline. Once at the top of the steep ridge, we looked back down into Sawmill Creek Valley and the road far below. Another sharp climb followed, which led us to the top of Sawmill Dome, another scenic viewpoint. We continued hiking along the ridgeline above Lake Superior and were awarded with many views of the lake and surrounding landscape. The views were awesome, but the weather continued to torment us. The never-ceasing wind blew in more threatening clouds, and just as we came out of tree cover onto an open stretch of trail along the side of a cliff, it began to hail. We retreated back into the trees, seeking shelter from the frozen, pea-sized bullets. The hail lasted for only five minutes, but the weather remained ominous. One minute the sky was clear and sunny, the next minute black clouds would float across the sky, bringing short bursts of rain before floating away again as if nothing had happened. Again, it never actually stormed; it was as if nature was taunting us and letting us know that it controlled us, not the other way around. Shortly before reaching Kennedy Creek, the SHT passes through a clearing and some land managed by a power company. As we walked through this clearing, to our left was a clear view out to Lake Superior. Though we were walking in sun, clouds hung over the lake, and we could see rain misting down over the water. There are campsites on the east and west sides of Kennedy Creek. We chose the west site, and proceeded to make up for not eating much that morning or the night before. The creek was completely dry, but Craig found a small lake nearby for water. We inhaled ramen noodles, followed by Pack-it Gourmet's banana pudding for dessert. Honestly, I do not remember whether we stopped for lunch on this day, or just ate a snack while hiking. I did not take many photos because I was attempting to conserve my frozen camera batteries, and once we set up camp, I was so cold that I did not write down many notes about the day. Once we cleaned up after our dinner, we chose a spot for our tent nestled in the trees directly alongside the dry creek bed. If the weather had been better and the creek flowing, it might have been a nice night. The reality was not so nice. It hailed again while we were pitching our tent, the temperature had dropped further, and now that we were not moving anymore, I was getting colder by the minute. I had put on additional layers before dinner, but they were no longer helping. When the tent was set up and our food bag hung, I got in the tent and did not come out again except when I had to go to the bathroom and could not hold it any longer. It was only 5:30; I was in for a very long, cold night. I put on nearly every item of clothing I brought – including my rain gear – and didn't take any of it off when I went to sleep. This included 2 pairs of wool socks, long underwear, hiking pants, rain pants, long-sleeved wool t-shirt, long-sleeved polyester t-shirt, fleece jacket, rain jacket (with hood up), wool hat and gloves. I laid in my sleeping bag and attempted to read a book and maybe take a nap to pass the time. For the first time since the beginning of the trip, we suddenly had company. I heard someone calling 'hello', and looked out to see a bearded 61-year-old man walking around in camp wearing shorts and a short-sleeved t-shirt. My first reaction was extreme irritation – one because I had to get half-way out of my sleeping bag to see what was going on and I was already cold because of it, and two, because he was clearly mocking me with his fashion choices. Although I only briefly spoke to him before grumpily crawling back into my sleeping bag for the night, I learned that he had hiked 18 miles that day and that he had begun his hike back in August. He had hiked the entire 235-mile length of the SHT from south-to-north, then turned around and was in the middle of hiking it back the other way. 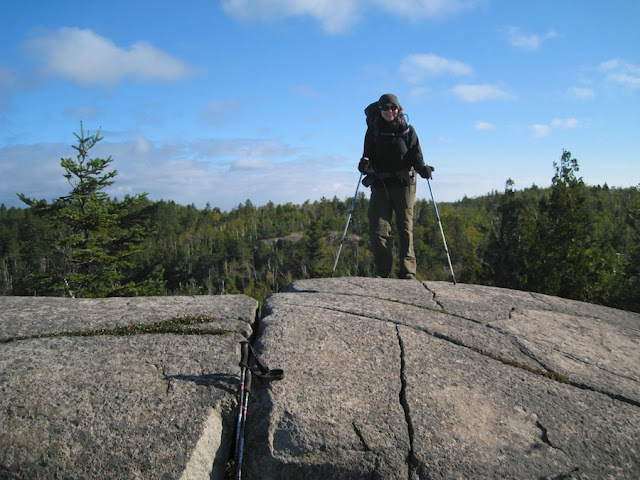 (The total length of the SHT is 277 miles, but the 42-mile segment south of Duluth is currently day-hiking only. He was considering tackling that portion after his current round trip.) He did not have any warm clothes with him, because it was hot when he started one month earlier. At some point when he passed through a town, he was going to buy warm clothes, but the cold came out of nowhere and he hadn't gotten around to it yet. He had been through a town a few days earlier and told us about the huge forest fire raging just north of us in the Boundary Waters area. This was the source of the mysterious ash that had been in the air over the last few days, and it was also contributing to the unusual weather. By this point the fire was big news across the country and we had had no idea. Our new friend's name was John (trail name: Farmer John), and we would end up learning many more interesting things about him the following day, when I was feeling more social. Until then, I would spend the coldest night of my life thus far, again getting very little sleep. What sleep I did manage was disturbed by a dream of my dog crawling up onto my chest to cuddle. The problem came when I realized that I hadn't brought my dog, so whatever was crawling on me could not be her. In my dream, I refused to open my eyes and began to reason with myself. By the feel of the paws and the weight, it must be a coyote; however, it would be impossible for a coyote to get past the tightly staked and zipped rain fly, then the zipped tent door without me waking up. Even when I'm not freezing to death and attempting to sleep on a bunch of rocks and tree roots, I'm a very light sleeper. One paw, then another, then the entire weight of a 50-lb animal was on me. It felt 100% real, and it was too much to handle anymore. I told myself that there was no way this could possibly be happening, that I had to be dreaming, and that I needed to wake up. That worked, but once I was awake I remembered how cold it was and thought death by midnight coyote attack might have been more enjoyable. On top of the bald on Section 13. Amazing 360º view! A check of the weather history after I returned home revealed that the overnight low had been 26º F. After the warm first 2 days (when I had actually been complaining that it was too hot and that I wanted cold weather), overnight/early morning lows for the rest of the trip were mid-20s to mid-30s. We thought we were pretty well-prepared for cold, but we hadn't anticipated nights below freezing. I thought of the couple from Kentucky that we met on the shuttle and wondered how they were holding up. 10:30 a.m. on Day 4: Our first glimpse of Lake Superior. Sometimes it would be good if you could both be in the same bag. Was he warm enough? Most guys put off a tremendous amount of heat.